Years ago, when I was new to California, a freshman in college during the fall of The Summer of Love, I woke the first morning in my dorm. It was 6:30 AM. A voice was spilling words into my ear that seemed part of my dream, and yet they were not. I remember the beauty of the voice, the language, and my disorientation from both. The singer was Judy Collins. 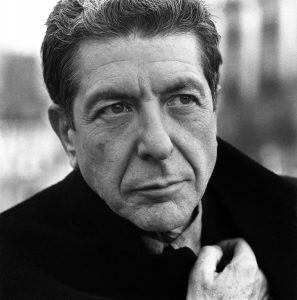 The song was Suzanne, by Leonard Cohen. See the link below to a Rolling Stone article and a performance of the song. Through the years, I held on to the lyric and the lovely guitar and voice. Then late one evening in the late 90s, I sat in the dark, listening to a recording of myself and my bandmates in Passenger, my band from the early 80s. It was a live performance, and Jeannine’s voice floated over Ashley’s keyboard and my acoustic guitar. On the choruses, unlike Judy Collins’s version, we sang three-part harmony. It was good. Michael, our drummer who sat out for that song, is heard to say, “Beautiful,” as the applause rises behind. That night, I was struck by the way that song had continued to weave its way into my life through the years. Not by accident, for certain, but perhaps unappreciated. So I began to write a poem in which I incorporated some of the lyrics from Cohen’s song into three verses, three stories from my life. The first was my college dorm. The second, that performance, transposed into a bar we used to play in Point Reyes Station. And the third, that night, in my home in San Rafael, with my daughter asleep upstairs, and the 18-year-old recording playing in the background. So it’s a “found poem” in a way, obviously owing a great debt to the original. But I wanted to capture the way the words of the song blended with my world. Here’s the poem, which I offer as a tribute to those people who shared the song with me over the years, to Judy Collins, for her beautiful rendition, and most of all to Leonard Cohen, who wrote those words and placed them in such a beautiful melody: one his own voice couldn’t quite convey, but which he clearly heard. Thank you, Leonard. Thank you, all. Below is the poem. Italics indicate my additions. The rest, Cohen’s lyrics. trusting in the seaweed morning, her mind. and she, certain only drowning men can see her. where you travel with her, blind. where the night air pools beneath the trees. to one cricket in the darkness. perfect, perfect it seemed, body and mind.